Ionizing radiation effects on cell populations as a genotoxic agent could lead to the appearance of cells with morphologically anomalous nuclei.,, Among these anomalies, micronuclei, nucleoplasmic bridges, and “tailed” nuclei are distinguished. Such anomalies arise after pathological mitotic divisions and are clearly distinguishable in a light microscope. In this case, the mechanism of their occurrence caused by ionizing radiation is associated with the formation of double-strand breaks of DNA and as a consequence ring and dicentric chromosomes. Micronuclei are the most studied form of nuclei pathology. They appear as fragments of the cell nucleus, which carry an incomplete part of the genome.,,,,, Micronuclei may contain either an acentric region of the chromosome or an entire chromosome that has not been distributed to one of the opposite poles during anaphase of mitosis. Fragments or whole chromosomes eventually become covered with a nuclear envelope and morphologically look similar to the cell nuclei, not exceeding one-third of its diameter. At the same time, several variants of micronucleus “fate” are possible: degradation of the micronucleus, its removal from the cell, apoptosis of the whole cell, or cooperation of the micronucleus with the basic cell nucleus. In addition to micronuclei, another types of nuclei pathology, generally accepted in radiobiology as markers of DNA damage, are nucleoplasmic bridges. Such bridges arise when the centromere of the dicentric chromosomes diverges to the opposite poles of the cell during anaphase. During the formation of two new nuclei of daughter cells in the telophase, the formed nucleoplasmic bridge is also covered with a nuclear envelope. Usually, it undergoes a rupture during cytokinesis, resulting in the formation of so-called “tailed” nuclei. In this connection, it is possible to observe nucleoplasmic bridges while studying cells in the cytochalasin block, where further division of the cytoplasm does not occur. “Tailed” nuclei were found in the cells of different fish species,, as well as in humans, after exposure to ionizing radiation. The formation of “tails” is closely related to the formation of nucleoplasmic bridges. It can be said that a cell exposed to ionizing irradiation undergoes a “breakage–fusion–bridge” cycle during repeated mitotic divisions. The resulting nucleoplasmic bridges break during cytokinesis with the formation of “tailed” nuclei. The end sections of such broken chromosomes are recognized by the DNA repair system as double-strand breaks and are cross-linked to form dicentric chromosomes. As a result, after anaphase, nucleoplasmic bridges are newly formed. The least studied markers of radiation exposure are the dumbbell-shaped nuclei. However, these forms of pathology of the cell nucleus were repeatedly detected in the peripheral blood lymphocytes in the liquidators of the consequences of the Chernobyl accident but were rarely described. The same form of nuclei can be observed in granulocytes of the peripheral blood of patients with the Pelger-Huet anomaly. The two nuclei were fused together, resembling a dumbbell or a figure “eight.” Morphologically, this form of nuclei differs from the nuclei connected by a nucleoplasmic bridge. The appearance of dumbbell-shaped nuclei is associated with the formation of dicentric and ring chromosomes. Thus, all nuclear anomalies appearing in the cell in response to the effects of radiation have a similar mechanism of formation. This mechanism is based on the introduction of double-strand breaks in DNA molecules by ionizing radiation. Only such powerful defects in the structure of DNA can lead to the formation of chromosomal aberrations, namely dicentric and ring chromosomes. Various defects in the distribution of dicentric chromosomes to the poles of the cell during the anaphase of mitosis lead to visually distinct cellular defects – nuclear anomalies. Considering all of the above, nuclear anomalies are a simple marker for bioindication and possibly biodosimetry even at small doses (from 0 to 2 Gy). The detection of micronuclei has already formed the basis for the widespread micronucleus test. However, other types of nuclei pathology have a mechanism of formation similar to the micronuclei, arising from chromosomal aberrations as a manifestation of their pleiotropic effect. Thus, in some cells, several anomalies can be formed at once. For example, in cells with dumbbell-shaped nuclei, one or more micronuclei can appear. These cells are not considered in modern biodosimetric tests despite their multi-aberration nature. This study contains the results of analyzing of “tailed” nuclei, nucleoplasmic bridges, and dumbbell-shaped nuclei. We described the dependence of their appearance in human lymphocytes cultured by the cytokinesis block method from the dose of X-ray radiation from 0 to 2 Gy. In parallel with nuclear anomalies formed after the first mitosis after radiation exposure, metaphase frequencies with dicentric and ring chromosomes were studied. In the experiment peripheral blood of female, 30-year-old, not smoking, not drinking donor was used. Heparinized blood was placed sterilely in 3-ml plastic syringes. Nine blood samples were irradiated with nine different doses: 0.0, 0.1, 0.2, 0.4, 0.5, 0.7, 1.0, 1.5, and 2.0 Gy. Irradiation was carried out at room temperature on a RUM-17 apparatus (200 kW, 13 mA, 1.0 mm Cu filter, a focal distance of 30 cm) at a dose rate of 0.6788 Gy/min. An hour after irradiation, blood samples were divided for two experiments and cultured: 0.5 ml of the blood was added to 4.0 ml of the medium Roswell Park Memorial Institute 1640 enriched with 10% fetal calf serum (Sigma, Missouri, USA) and phytohemagglutinin (PHA; Gibco, Waltham, MA) in sterile glass tubes (0.15 ml/5 ml of medium). To prepare slides with binuclear cells for nuclei anomalies analysis, cytochalasin B (Sigma, Missouri, USA) at a final concentration of 3 μg/ml was added to the first part of blood samples at the 44th h of the incubation. The stock solution of cytochalasin B was prepared by dissolving 1.0 μg of the lyophilized material in 1.1 ml of dimethyl sulfoxide just before the experiment. After that, the cultivation was stopped at the 72nd h. The cells were treated with a 0.1 M KCl solution for 3 min and then centrifuged for 10 min. The supernatant was then removed, and the precipitate was fixed with a freshly prepared mixture of methanol and glacial acetic acid in a 3:1 ratio and then centrifuged. The procedure was repeated four times. All supernatants were discarded, and drops of fixed cell suspension were applied to clean glasses. The preparations were dried and stained with Azure II-eosin according to Romanovsky. The nuclear anomalies were scored in at least 2000 cells at each of nine doses of irradiation (0.0, 0.1, 0.2, 0.4, 0.5, 0.7, 1.0, 1.5, and 2.0 Gy) using the magnification of ×1000. To obtain metaphase chromosomes, another part of the donor peripheral blood samples was cultured for 51 h. During the entire time of cultivation, bromodeoxyuridine (Sigma, Missouri, USA) was administered at a concentration of 10 μg/ml to indicate the first division of mitosis. To obtain metaphase plates, colchicine (Sigma, Missouri, USA) was added into the peripheral blood culture 3 h before fixation at a concentration of 0.06 μg/ml. Then, cells were treated hypotonically with 0.55% KCl for 40 min at 37°, with a subsequent three time change of chilled fixator (methanol/glacial acetic acid in the 3: 1 ratio) for 1 h. Preparations of chromosomes were made by placing the cell suspension in humidified glasses. Then, the slides were stained with Azure II-eosin according to Romanovsky and were calculated for dicentric and ring chromosomes. At least 500 metaphase plates were analyzed for each of seven doses (0.0, 0.2, 0.4, 0.7, 1.0, 1.5, and 2.0 Gy). Statistical analysis was performed with the use of Student's t-test for confidence intervals calculation and also Pearson's correlation coefficient to establish correlation between frequencies of nuclei abnormalities and chromosomal aberrations. Where D is the dose in Gray and Y is the frequency of lymphocytes with dicentric and ring chromosomes. Remarkably, there are no statistically significant differences between values of frequencies of metaphases with dicentric and ring chromosomes observed on 0.2 and 0.4 Gy. It is quite possible that this dose range corresponds to the plateau. The dose-dependent curve of occurrence of metaphases with dicentric and ring chromosomes at different doses from 0.0 to 2.0 Gy is shown in [Figure 1]. Along with the dicentric and ring chromosomes, we also registered marker chromosomes characterized by elongated long shoulders. 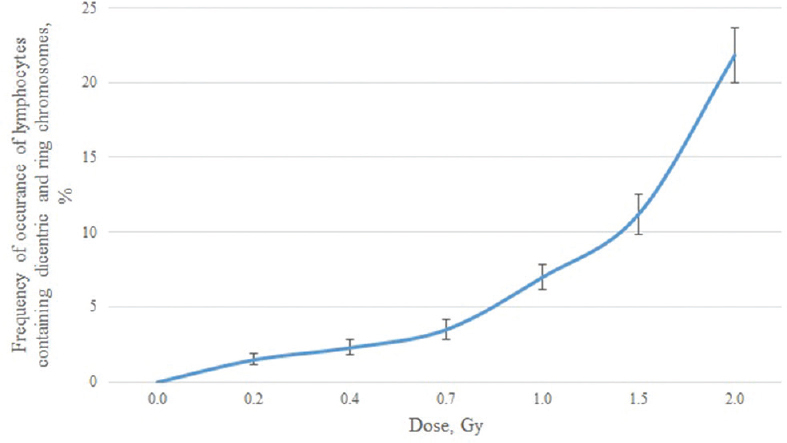 It turned out that the frequency of metaphases with such markers was 0.0 Gray – 0.0000, after irradiation with doses of 0.2 Gy – 0.0000, 0.4 Gy – 0.0010, 0.5 Gy – 0.0025; 0.7 Gy – 0.0026, 1.0 Gy – 0.0050; 2.0. Gy – 0.0046; 3.0 Gy – 0.038, and 4.0 Gy – 0.025. “Tailed” nuclei appeared as the outgrowths of the cell nuclei of lymphocytes, coinciding with the nucleus itself in the intensity of the staining [Figure 2]. Where D is the dose in Gy and Y is the frequency of occurrence of lymphocytes with “tailed” nuclei. [Figure 3] shows the dose-dependent curve of occurrence of lymphocytes with “tailed” nuclei at different doses from 0.0 to 2.0 Gy. Where D is the dose in Gy and Y is the frequency of lymphocytes with nucleoplasmic bridges. [Figure 5] shows the dose-dependent curve of the occurrence of lymphocytes with nucleoplasmic bridges at different doses from 0.0 to 2.0 Gy. Dumbbell-shaped nuclei represent two closely spaced nuclei of the interphase cell, reminiscent of the shape of a figure “eight” or dumbbell [Figure 6]. The cell size is not increased comparing to the cells with normal nuclei, and the area occupied by the dumbbell-shaped nuclei is visually equal to the area occupied by the two separated cell nuclei. 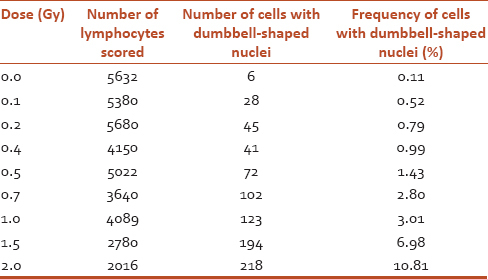 It turned out that in more than half of the cases of observing dumbbell nuclei in such cells, there is also one or several micronuclei (data not shown). Where D is the dose in Gy and Y is the frequency of lymphocytes with dumbbell-shaped nuclei. 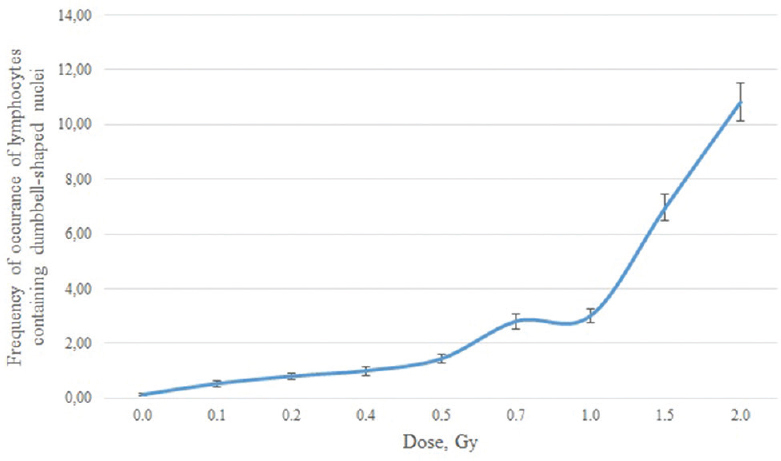 [Figure 7] shows the dose-dependent curve of the occurrence of lymphocytes with dumbbell-shaped nuclei at different doses from 0.0 to 2.0 Gy. Results indicate that the frequency of occurrence of cultured lymphocytes with “tailed” nuclei positively correlates with the frequency of occurrence of lymphocytes with dicentric and ring chromosomes (r = 0.89, P < 0.005) and does not correlate with the frequency of occurrence of lymphocytes containing chromosomes with elongated shoulders. It is important to note that at all the doses studied, the values of the frequencies of dicentric and ring chromosomes were significantly higher than the values of the frequencies of the “tailed” nuclei. Apparently, a significant part of the nucleoplasmic bridges formed by dicentric and ring chromosomes under the conditions of our experiment are not realized in “tailed” nuclei. At the same time, the frequency of chromosomal aberrations increased sharply from 0.7 Gy, and the frequency of “tailed” nuclei was insignificant. This suggests that the formation of dicentric and ring chromosomes leads to the formation of not only “tailed” nuclei but also other nuclear anomalies. Attention is drawn to the similarity of the nucleoplasmic bridges and the “tails” of the nuclei. This confirms that one of the reasons for the appearance of “tailed” nuclei is just the breakage in the nucleoplasmic bridge. 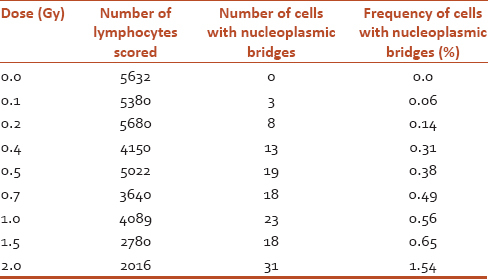 In many cases, cells with nucleoplasmic bridges contained one or more micronuclei, which confirms the pleiotropic nature of the appearance of nuclear anomalies. The frequency of occurrence of lymphocytes with nucleoplasmic bridges also positively correlates with the frequency of occurrence of dicentric and ring chromosomes (r = 0.97, P < 0.05); however, the total frequency of occurrence of “tailed” nuclei and nucleoplasmic bridges is still lower than the frequency of chromosomal aberrations at all doses. This is due to the fact that in the anaphase of mitosis with the divergence of chromosomes, the dicentric chromosome can form a bridge between the daughter nuclei only if its two centromeres are oriented to different poles of the dividing cell. However, if both centromeres of dicentric chromosome are oriented to one pole, then after the first division of mitosis, the nucleoplasmic bridge will not be formed. The probability of these events is approximately the same, which indicates that two cells with chromosomal aberrations should have one cell with a bridge or “tail.” However, for example, with irradiation with a dose of 1 Gy, 7.0% of cells containing chromosomal aberrations are observed, but in reality, only 3% of cells with “tailed” nuclei (2.4%) and bridges (0.56%) were formed. When irradiated with a dose of 2 Gy, 21.8% of cells were with chromosomal aberrations and only 5.51% of cells were with “tailed” nuclei (3.97%) and bridges (1.54%). This suggests that there is another anomaly into which chromosomal aberrations are transformed under the action of ionizing radiation, which is especially often encountered at high doses. Such an anomaly is likely dumbbell-shaped nuclei. As a result of our studies, a correlation was found between the frequency of occurrence of dumbbell-shaped nuclei and the frequency of occurrence of dicentric and ring chromosomes in irradiated lymphocytes (r = 0.99, P < 0.05). 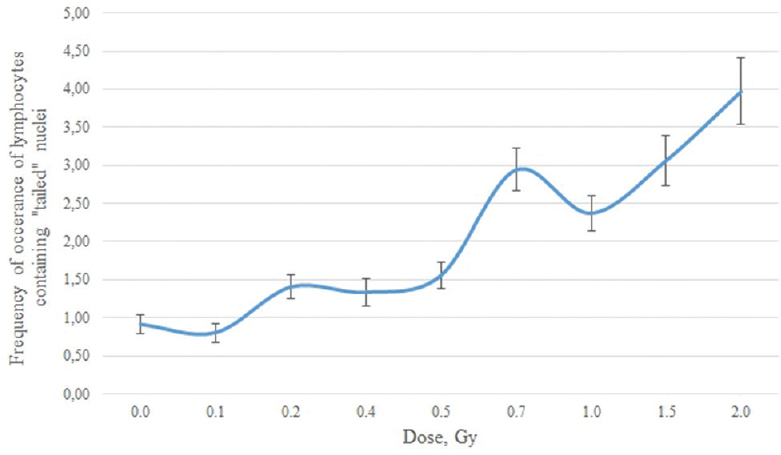 A small plateau is observed on the dose-dependent curve of the occurrence of dumbbell-shaped nuclei from the irradiation dose between 0.2 and 0.4 Gy. The same plateau can be seen at these doses on the frequency curve of the occurrence of dicentric and ring chromosomes. Among other anomalies, dumbbell-shaped nuclei have the curve of the dependence of the frequency most coinciding with the corresponding curve for dicentric and ring chromosomes. A general diagram showing the frequencies of all nuclear anomalies and chromosome aberrations from the radiation dose is shown in [Figure 8]. 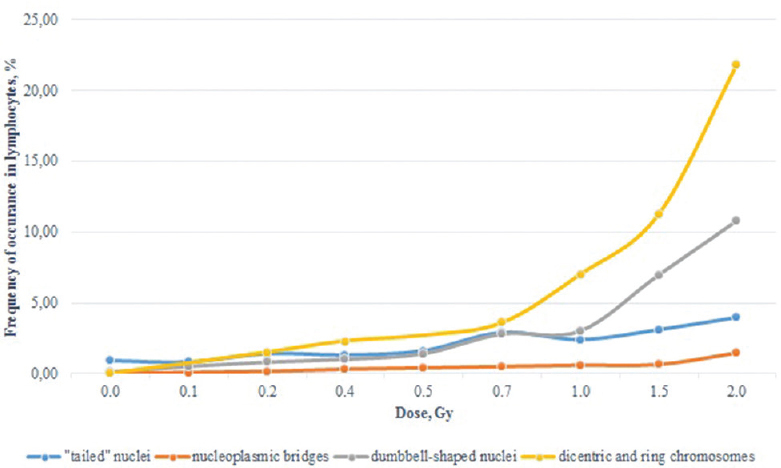 Frequencies of dumbbell-shaped nuclei were proportionally lower than the frequencies of lymphocytes carrying chromosomal aberrations at all radiation doses, but keeping a positive correlation between both of them. 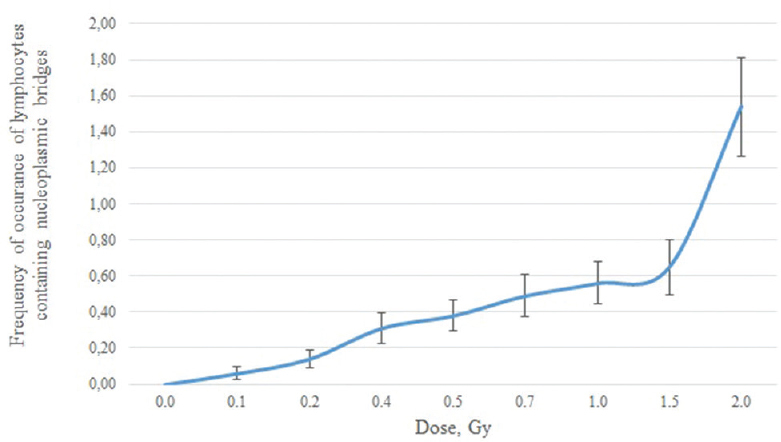 More than that, the frequencies of occurrence of dumbbell-shaped nuclei on the last two doses of radiation (1.5 and 2.0 Gy) were significantly higher than earlier ones. The same rise was observed on the curve of frequency of chromosomal aberrations on high doses. We consider this to be especially important since it most likely means that at high doses, the majority of dicentric chromosomes formed are realized precisely as dumbbell-shaped nuclei. Thus, this could be the main nuclear anomaly, which should be paid attention to during biometric tests. Probably, these results indicate that the biometric and biodosimetric tests widely used today require a serious correction at high doses of radiation with allowance for dumbbell-shaped nuclei. The mechanism of the appearance of dumbbell-shaped nuclei is discussed. Thus, the appearance of dumbbell-shaped suspensions in the cell nucleus was attributed to the morphological features of amitosis, the direct method of cell division, in which the components of the nucleus are distributed unequally between daughter nuclei., Later, dumbbell-shaped nuclei were found in intensively dividing cells at low temperature and under nutrient deficiency. Thus, the mechanism for the appearance of such a form of the nucleus is unclear. We managed to find out that the nature of dumbbell-shaped nuclei is connected with several nucleoplasmic bridges that are part of their composition. [Figure 9] shows a cell with a dumbbell-shaped nucleus with nucleoplasmic bridges detected in its composition. More than that, bridges start in the first nucleus and end in the second. In our understanding, these bridges are dicentric chromosomes, the centromeres of which during the anaphase of mitosis were distributed to the opposite poles of the dividing cell. This is confirmed by the presence of micronuclei, which may contain isolated paired acentric fragments corresponding to these dicentrics. Probably, the main factor, due to which the dicentric chromosomes in our experiment passed precisely to dumbbell-shaped nuclei, and not to other types of nuclear anomalies, is the effect of cytochalasin B. It remains to note that the counting of cells with dumbbell-shaped nuclei is simpler than the cytogenetic analysis of metaphase chromosomes, which makes them attractive as biometric and biodosimetric markers. When dumbbell-shaped nuclei are formed at high radiation doses, micronuclei are also formed, which are not taken into account in the traditional protocol of the micronucleus test. Accounting for dumbbell-shaped nuclei and their micronuclei is necessary, since the nature of their occurrence at high doses is common and is associated with the formation of several dicentric chromosomes that make up the dumbbell-shaped nuclei, as well as several acentric fragments that separate themselves in the form of micronuclei. The data presented confirm the general nature of the origin of different types of nuclear anomalies due to chromosomal aberrations arising in human peripheral blood lymphocytes under the influence of ionizing radiation under cultivation with cytochalasin B. In addition to the widely known “tailed” nuclei and nucleoplasmic bridges in human lymphocyte culture under the action of cytochalasin B, a large number of such nuclear anomalies as dumbbell-shaped nuclei are formed. Moreover, the presented results suggest that in most cells in which chromosomal aberrations have arisen under the action of ionizing radiation, they do lead to the formation of dumbbell-shaped nuclei, and this trend increases with increasing radiation dose. Metaphase plates were obtained with the help of Natalya Yartseva, Institute of Cytology of the Russian Academy of Science, Saint-Petersburg, Russian Federation. IAEA research contract No 302-J1-RUS-10146.1/Regular Budget Fund supported the study. Joseph LJ, Patwardhan UN, Samuel AM. Frequency of micronuclei in peripheral blood lymphocytes from subjects occupationally exposed to low levels of ionizing radiation. Mutat Res 2004;564:83-8. Blakey DH, Duncan AM, Wargovich MJ, Goldberg MT, Bruce WR, Heddle JA, et al. Detection of nuclear anomalies in the colonic epithelium of the mouse. Cancer Res 1985;45:242-9. Sayed Ael-D, Oda S, Mitani H. Nuclear and cytoplasmic changes in erythrocytes of p53-deficient medaka fish (Oryzias latipes) after exposure to gamma-radiation. Mutat Res Genet Toxicol Environ Mutagen 2014;771:64-70. Fenech M, Kirsch-Volders M, Natarajan AT, Surralles J, Crott JW, Parry J, et al. Molecular mechanisms of micronucleus, nucleoplasmic bridge and nuclear bud formation in mammalian and human cells. Mutagenesis 2011;26:125-32. Savage JR. A comment on the quantitative relationship between micronuclei and chromosomal aberrations. Mutat Res 1988;207:33-6. Savage JR. Micronuclei: Pitfalls and problems. Atlas of genetics and cytogenetics in oncology and haematology 2000;4:229-33. Pironon N, Puechberty J, Roizès G. Molecular and evolutionary characteristics of the fraction of human alpha satellite DNA associated with CENP-A at the centromeres of chromosomes 1, 5, 19, and 21. BMC Genomics 2010;11:195. Schueler MG, Sullivan BA. Structural and functional dynamics of human centromeric chromatin. Annu Rev Genomics Hum Genet 2006;7:301-13. Norppa H, Falck GC. What do human micronuclei contain? Mutagenesis 2003;18:221-33. Hintzsche H, Hemmann U, Poth A, Utesch D, Lott J, Stopper H, et al. Fate of micronuclei and micronucleated cells. Mutat Res 2017;771:85-98. Meenakshi C, Sivasubramanian K, Venkatraman B. Nucleoplasmic bridges as a biomarker of DNA damage exposed to radon. Mutat Res 2017;814:22-8. Hamza VZ, Mohankumar MN. 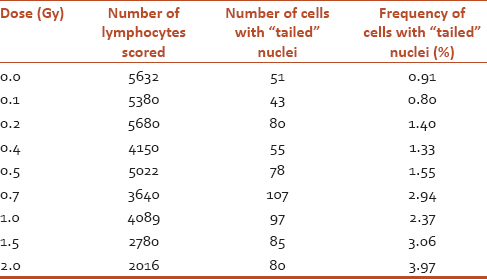 Cytogenetic damage in human blood lymphocytes exposed in vitro to radon. Mutat Res 2009;661:1-9. Fenech M, Crott JW. Micronuclei, nucleoplasmic bridges and nuclear buds induced in folic acid deficient human lymphocytes-evidence for breakage-fusion-bridge cycles in the cytokinesis-block micronucleus assay. Mutat Res 2002;504:131-6. Anbumani S, Mohankumar MN. Nucleoplasmic bridges and tailed nuclei are signatures of radiation exposure in Oreochromis mossambicus using erythrocyte micronucleus cytome assay (EMNCA). Environ Sci Pollut Res Int 2015;22:18425-36. Prokofjeva-Belgovskaya AA. Radiation damage in chromosomes on early stages of development of Salmo salar. Tsitologia 1961;3:437-45. Kravtsov VY, Fedortseva RF, Starkova YV, Yartseva NM, Nikiforov AM. Tailed nuclei and dicentric chromosomes in irradiated subjects. Appl Radiat Isot 2000;52:1121-7. Kravtsov VIu, Fedortseva RF, Loginova IuA, Starkova EV, Tiukacheva MV, Iakovlev AF, et al. 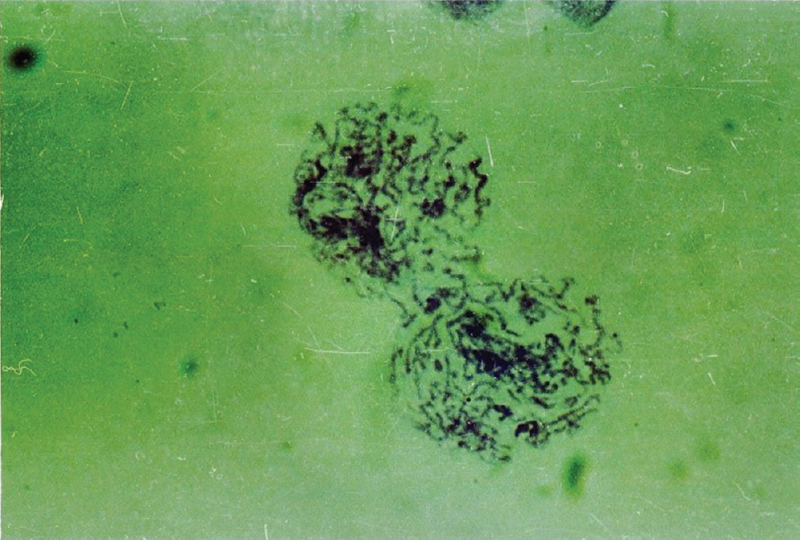 Morphological anomalies in “tailed” lymphocyte nuclei and their connection with dicentric chromosomes in irradiated patients. Genetika 1997;33:1675-80. Deshuillers P, Raskin R, Messick J. Pelger-huët anomaly in a cat. Vet Clin Pathol 2014;43:337-41. Nikiforov AM, Fedortseva RF, Monosova EK, Iartseva NM, Kravtsov VI. Nuclei with protrusions–”tailed” nuclei – And radiation cytogenetic markers in a lymphocyte culture after x-ray irradiation. Radiats Biol Radioecol 2000;40:299-304. Flemming W. Entwicklung und Stand der Kenntnisse uber Amitose. Merkel und Bonnet's Ergebnisse. (Development and state of knowledge about amitosis. Merkel and Bonnet's results). 1892;2: 37-82. Remak R. Ueber extracellulare Entstehung thierischer Zellen und über Vermehrung derselben durch Theilung (On extracellular formation of animal cells, and on their multiplication by division). Archiv für Anatomie, Physiologie und wissenschaftliche Medizin (Archive of Anatomy, Physiology and Scientific Medicine) Verlag von Veit et Comp. Berlin. 1852; 47-57. Bucher O. Die Amitose der tierischen und menschlichen Zelle (The amitosis of the animal and human cell). Springer-Verlag, Wien. 2013.